The globular cluster Messier 2. © Michael Richmann. M2 (NGC 7089) is a large, bright globular cluster in the constellation Aquarius. It was discovered by Jean-Dominique Maraldi in 1746 while he was observing a comet with Jacques Cassini. Charles Messier rediscovered it in 1760 but believed it to be a nebula without any associated stars. William Herschel was the first to make out individual stars within it in 1794. M2 lies 5° north of the star Beta Aquarii and is easily visible through binoculars or small telescopes as a fuzzy patch. Larger telescopes will resolve individual stars, of which the brightest are of apparent magnitude 13.1. 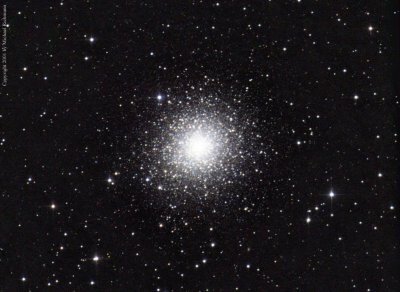 M2 is among the largest and, with an estimated age of 13 billion years, among the oldest globular clusters in the Milky Way. It is highly concentrated, significantly elliptical and contains about 150,000 stars, the brightest of which are red and yellow giants.